It’s a roasty, chocolaty brown ale with hints of coffee and liquorice. 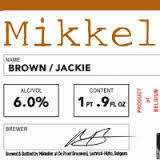 Mikkellers tribute to the foul-mouthed stewardess Jackie Brown from Quentin Tarantinos movie of the same name. Beeing a Mikkeller brew the malts are inevitably complimented by a great amount of hop bitterness, aroma and flavour.